This early Thunderbolt is one of the documented 100 produced and one of the few remaining examples of Ford’s all-out assault on drag racing in the 1960s. 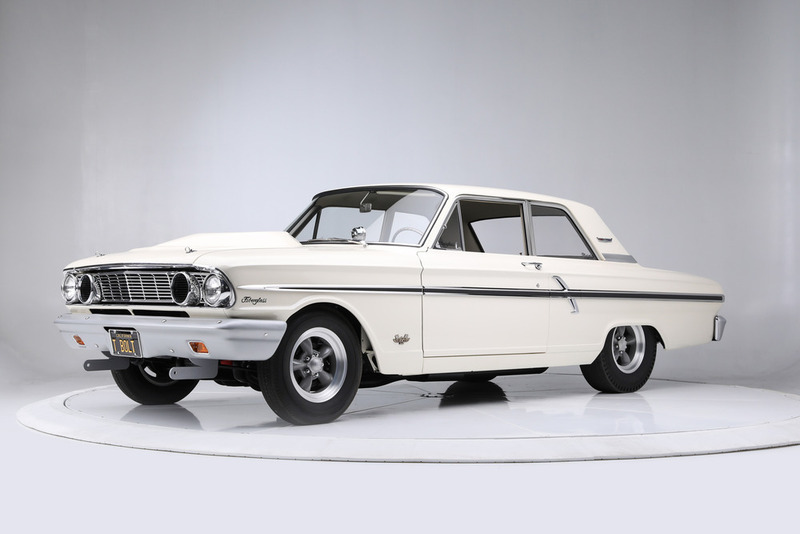 Ford delivered the Thunderbolt Fairlane 500s as K-code, high-performance 289ci, 4-speed cars. They arrived less the engine and transmission. By ordering the K-code engine, the car was shipped with larger brakes and the legendary Ford 9-inch differential. The chassis was reinforced and modified to accommodate a 427ci “high-riser” FE engine with two 4-barrel carburetors, the original steel hood and front quarter-panels were replaced with fiberglass, and a special “teardrop” hood was installed. Weight-saving measures included the elimination of many items; what remained inside the car was a single driver’s sun visor, windshield wiper and seat belt, as well as lightweight Bostrum Thinline racing seats. The Thunderbolts were also delivered with drag racing slicks as standard equipment. This particular example was delivered to Max Larson Ford in Coldwater, Michigan, on December 26, 1963, and resold on April 21, 1964, to Jack Mefford Ford in Springfield, Ohio, where it was campaigned throughout the Ohio Valley. Originally produced with an automatic transmission, this car was quickly converted to a Ford Toploader 4-speed manual. This common Thunderbolt conversion created a very competitive car in the Super Stock (S/S) classification. The current owner, whose late uncle was Ford drag racing legend Les Ritchey, purchased the car in 2015 from a collector’s estate; it had been stored in an Arizona warehouse for an estimated 30 years and the odometer indicated less than 400 miles. The vehicle then underwent a meticulous yearlong nut-and-bolt concours restoration to bring it back to “as campaigned” in the 1960s. After its restoration, the car was displayed at some major Concours d’Elegance events throughout California in 2017, garnering several Best in Class and First in Class awards, as well as the Historical Vehicle Association’s National Automotive Heritage Award at the Carmel-By-The-Sea Concours. 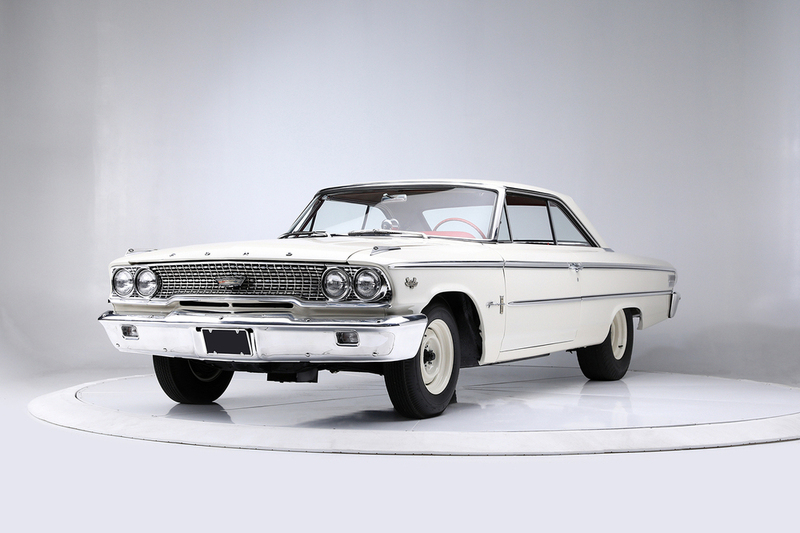 This historically significant car comes with a Letter of Authentication from the Thunderbolt Owners Association, as well as a Ford dealer memorandum dated February 21, 1964. -- SALE PENDING -- Beginning with an all-original body, this 1965 Chevrolet Corvette convertible underwent a professional body-off-frame, complete nut-and-bolt, no-expense-spared restoration by Classic Resurrection in Grove City, Ohio, with hundreds of photos essentially showing the car become brand-new again from bumper to bumper. Since completion, it has always been garaged and never seen rain or bad weather. With a new convertible top, new chrome, new headlights, new aluminum radiator with electric fan and Optima battery with cutoff switch, and five beautiful coats of Torch Red paint, the foundation is set for something special. 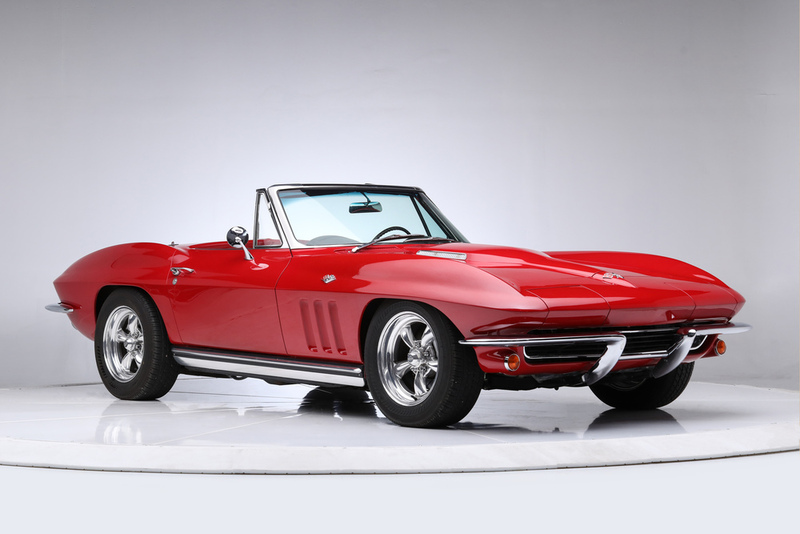 This is the perfect blend: An original 1965 Chevrolet Corvette convertible combined with the drivability and enjoyment of today’s modern car, with more responsive power, better handling, better braking and comfort. This car hits all those points, beginning with a new Chevrolet Performance Parts 350ci high-output deluxe crate engine with MSD distributor, ignition coil and FiTech fuel injection system backed by a 700-R4 automatic transmission. For handling, the fully adjustable autocross-type suspension with new coilover shocks, springs and sway bars make for a great ride. Bringing it all to a halt are all-new 4-wheel power disc brakes, from booster and SS lines to calipers and discs. And for comfort, there’s a new black leather interior and carpet, power steering, power antenna and air conditioning. With all the boxes checked, this 1965 Chevrolet Corvette convertible Resto-Mod is ready for spirited, top-down driving with nothing to worry except what to explore next! 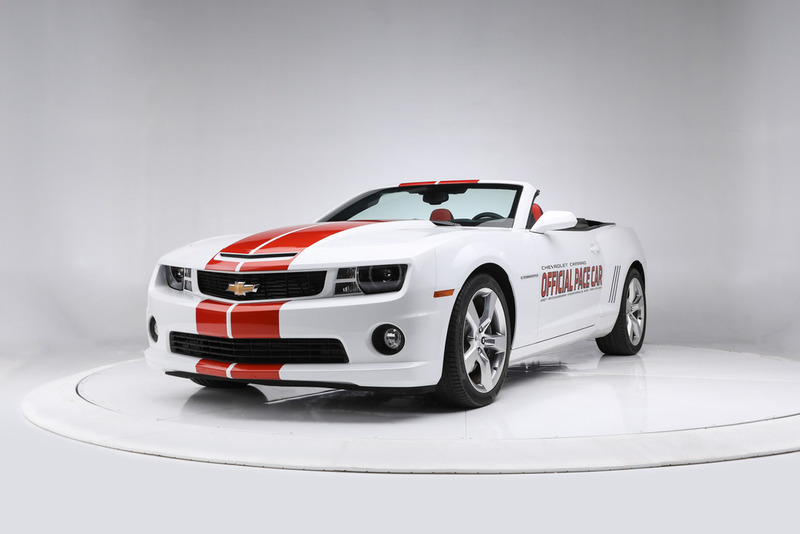 2011 was the 100th anniversary of Chevrolet, and to celebrate the automaker partnered with the Indianapolis 500 to offer 500 matching Indy pace car replicas so enthusiasts could purchase their own piece of history. The pace cars featured a Summit White exterior accented with orange stripes and door graphics. The interior is trimmed in orange leather, with front-seat headrests embossed with the Indy 500 logo, along with white door panels and instrument panel trim. The instrument panel trim also features extensions of the orange exterior stripes. The color combination is similar to the design used on the 1969 Camaro Indy pace car – replicas of which have become among the most popular Camaros in the collector world. With less than 600 miles on the odometer, this highly equipped 100th Anniversary pace car is caught somewhere between wanting to take on the banked oval and secreting itself away as a collector’s item. Powered by the 6.2-liter LS3 V8 (426hp) engine and backed by a 6-speed automatic with paddle shift on the steering wheel, the car begs for spirited top-down driving. Modern conveniences include remote vehicle start, heads-up display, limited slip differential/Stabilitrak with traction control, Brembo performance brakes, a Boston Acoustics Premium 8-speaker audio system with 10.5” subwoofer, satellite radio, tilt-telescopic steering wheel and the auxiliary gauge package tucked between the sport bucket seats in the console. Showing a clean, one-owner CARFAX out of New Mexico, this Camaro is virtually flawless and all but new, and would certainly fit perfectly into the second owner’s garage. In 1970, when people thought “muscle car,” “Malibu” was in the same sentence. The second-generation Malibu was a fitting evolution of the original and moved to the upscale Chevelle neighborhood. The 2-door sports coupe (hardtop) body style was semi-fastback, but not so “fastback” to be unfashionable. 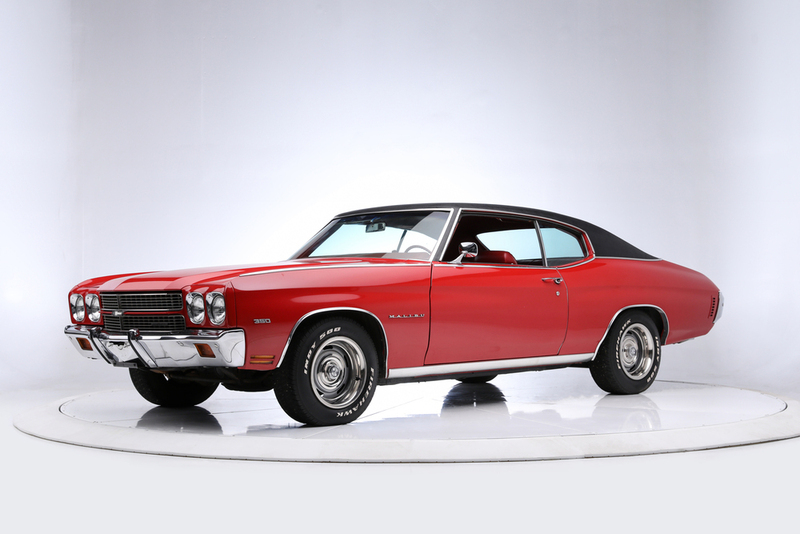 Considering the Malibu line had only been introduced to the public a few short years prior, a sales rate over 265,000 upscale versions of the Chevelle were nothing to sneeze at in 1968, and Malibu handily outsold the lower-spec Chevelle line. Equipped with its original matching-numbers 350ci V8 CRE-code engine kicking out 300 horsepower and a Turbo Hydromatic 350 automatic transmission, this heavily documented Malibu came fully equipped with power steering, power brakes, factory air conditioning, Cranberry Red paint with a black vinyl roof (code 75 B) and a red vinyl bench seat, Rally wheels and white-letter tires. The car’s Build Sheet, Protect-O-Plate and Window Sticker complete the “trifecta” of documentation for any avid collector proving the originality of their car. This car fits the definition of an honest and authentic “time capsule” ready to star at the next local show and make a real statement. While there were 243,000 Camaros produced for the extended 1969 model year, only 20,302 were Z/28s. The first-generation Camaro Z/28s are among the most collectible and sought-after Camaros ever produced. This example is special and significant on many levels. Having been authenticated, certified and inspected multiple times by the well-known Jerry MacNeish of Camaro High Performance, Inc., it retains its original trim plate with Option code X-77, indicating it is a true Z/28. The entire driveline is proven and inspected to be matching-numbers, with engine, transmission and rear end all original to the car. Finished in its correct and desirable Dusk Blue paint with deluxe black interior, it also features options that include tinted glass, center console, spoiler equipment, posi-traction 3.73:1, M22 HD transmission, special instrumentation, power steering and more. A complete frame-off, nut-and-bolt concours-level restoration was completed on the car, which was then judged on multiple occasions at Chicago’s Chevy VetteFest Nationals, most recently getting an unprecedented 999 points out of 1,000 in November 2004. A 3-inch binder with judging sheets, ownership history with titles and letters from owners, Concours Gold awards from Muscle Car/Corvette Nationals, and receipts for parts and labor with framed storyboards will all be going to the next owner. Since its significant notoriety of being one of the most documented and accurate Z/28s in existence and having spent the last number of years in a private collection in a climate-controlled environment, it is still in pristine and flawless condition, with nothing needed other than an equally passionate and appreciative new owner. 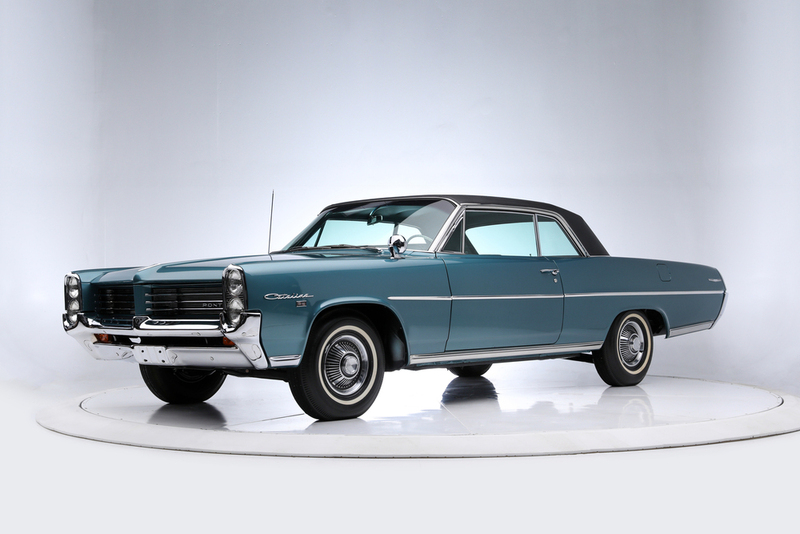 Originally built in January 1964 in Pontiac, Michigan, and restored to concours standards with a nut-and-bolt, frame-off rotisserie restoration, this 1964 Pontiac Catalina 2+2 may be one of the nicest available in the market today. Detailed as built from the factory in the correct Acrylic Lacquer “Q Code” (Gulfstream Aqua) paint, along with new correct black Cordova (vinyl) top, inside it sports black vinyl bucket seats (code 82B) with a 2+2 trim option (code 381). The car’s restoration was exacting, to say the least, specifically using all available New Old Stock (NOS) and authorized GM licensed parts only. Perfect for the purist who wants an unaltered and accurate car from its factory build specifications, the odometer was reset to zero miles upon completion, and now shows less than 400 miles driven since. This richly documented car comes with photos of the original owner, his wife and brother when it was purchased in 1964, as well as Pontiac Historic Services (PHS) paperwork, the original warranty paper and owners’ manual, and original Bill of Sale. Window Sticker factory options include AM push-button Super Deluxe radio, optional rear speaker, power steering, power brakes, date-coded soft-ray tinted glass, remote left outside fender-mounted mirror, backup lamps, dash lock, inside day/night mirror, deluxe steering wheel, deluxe wheel covers, 2-speed wiper motor with washer, and front and rear floor mats. Seemingly in as good (or better) condition today than when it was delivered 55 years ago, it is a remarkable breath of fresh air, showcasing originality and attention to every detail. The Ford Mustang Cobra is the quintessential muscle car. It stands out as one of the best-looking vehicles on the road. The Cobra has always represented the next step from joyriding to the thrill of the race as you whip around corners with tight handling at blazing speeds. With different lines of Cobras over the years, it’s easy to think that the Mustang Cobra has always been with us. However, there were years when this king of the road skipped a new model or retired early to address concerns with overall Mustang production. As the Cobra has always been the pinnacle of performance, the SVT legacy with more powerful engines, handling upgrades and design cues, blossomed again for a fourth generation beginning in 1994. 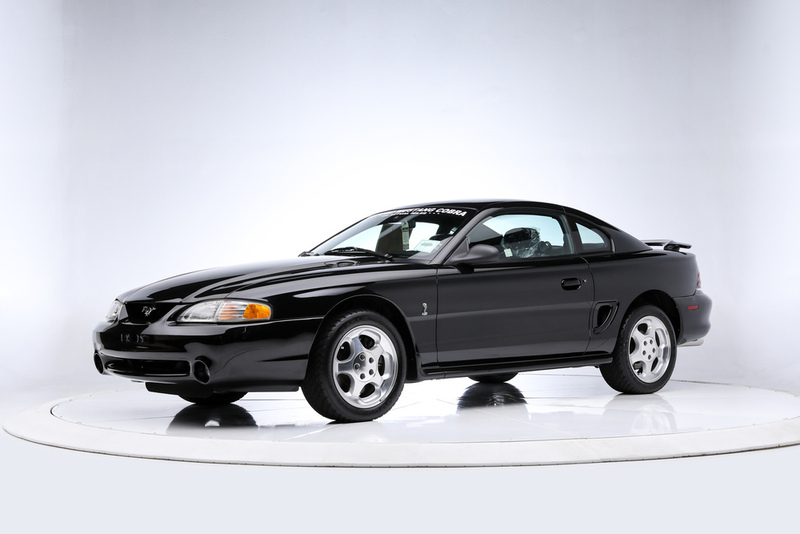 Production numbers show only 760 1995 Ford Mustang SVT Cobra two-door coupes were ordered like this one, in black clear coat with a black leather interior. 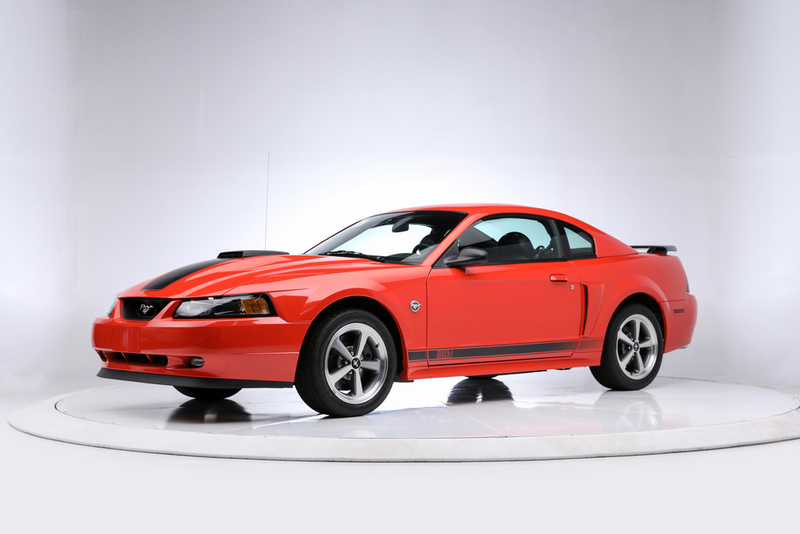 This example is one of the lowest-mileage Cobras in existence, showing just 105 actual miles on the odometer and literally still “in the wrapper.” This collectible and desirable high-performance Mustang Cobra has existed almost 25 years without the removal of all plastic protecting the interior from the dealer. Never dealer-prepped, it represents a stunning and remarkable time capsule, with all documents and property meticulously preserved just like the day it was delivered. The original MSRP, still on the passenger window, shows this Cobra came with the Preferred Equipment Package (speed control, rear window defroster, air conditioning and floor mats), keyless remote, upgraded Mach 460 AM/FM stereo cassette, compact disc player and leather surface sport bucket seats. A framed copy of dealer invoice and Window Sticker, manuals, books, copy of original purchase contract and title, and two binders summarizing all the provenance from new will all be given to the next owner. 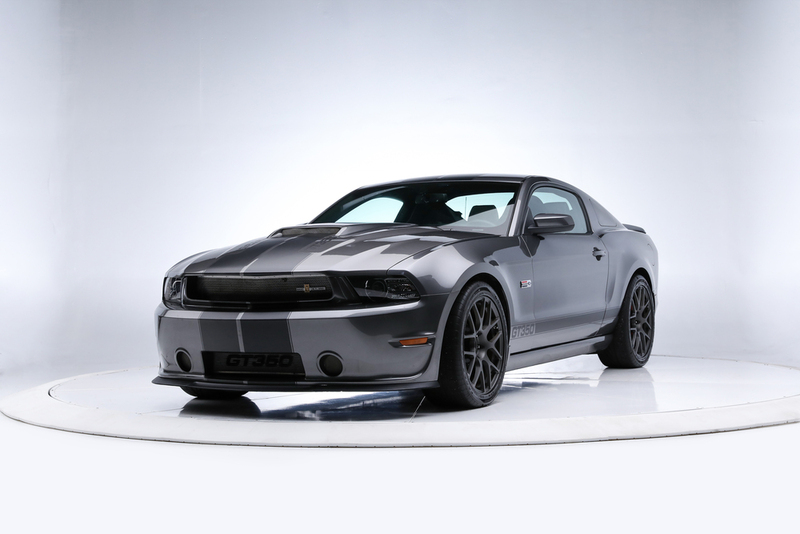 Production of the Ford Shelby GT350 in 2014 – its final year – ended with just 87 built. “The model’s limited production has long been part of its appeal,” said John Luft, president of Shelby American, at the time. “When this car was unveiled, we promised that the modern version of the Shelby GT350 would be available for a limited run. This decision was made to preserve the Shelby American-built GT350’s collectability and value. We've been preparing for this day since Shelby American launched this in 2010.” Shelby’s customization of the GT350 varied, but began at $26,995 on top of the price of the car. Features of the souped-up Pony car included body add-ons, 19” aluminum alloy wheels, racing-style suspension, sport-tuned brakes and, for some, a supercharger, bumping the horsepower to over 600hp. Documented with a copy of the sales order from Shelby American, Inc., in Las Vegas, this GT350’s options totaled $46,752. At the heart of the modifications was a black 624 FR Whipple supercharger and included numerous other options, such as red brakes, FRPP suspension, matte black stripes and satin black wheels, upgraded cooling system, Billett Watts link, GT500 rear spoiler, body color block-offs, upper/lower control arms and premium floor mats (still in the plastic). The MSRP touched $98,224 for the car when it was completed and was offered by Ford Country in Henerson, NV. According to the clean, one-owner CARFAX, this Sterling Gray Metallic Shelby with a Recaro black leather interior was first registered in Texas and subsequently serviced there. With an odometer currently reading just under 400 miles from new, CSM143500032 is still “in the wrapper,” with some plastic still apparent in the car. A collectible car from its final year of production, this GT350 impresses with aggressive performance, exhilarating handling and exceptional craftsmanship. Chevrolet’s original Pony car continued as a mainstay in the automaker’s lineup in 2000, offering coupe and convertible styles in standard and SS (Z/28) trims, with engines ranging from a 200hp 3.8-liter V6 to a 305hp 5.7-liter EFI LS1 V8 that generates 335 ft/lbs of torque in the SS version. The SS versions received slightly improved exhaust and intake systems, bigger wheels and tires, a slightly revised suspension for improved handling and grip while retaining ride comfort, an arc-shaped rear wing for downforce and different gearing ratios for faster acceleration. The WU8 Camaro Super Sport (SS) package was so popular, 8,913 customers spent $3,950 for the engine, cold-air intake hood, special suspension, 17-inch wheels and SS trim. 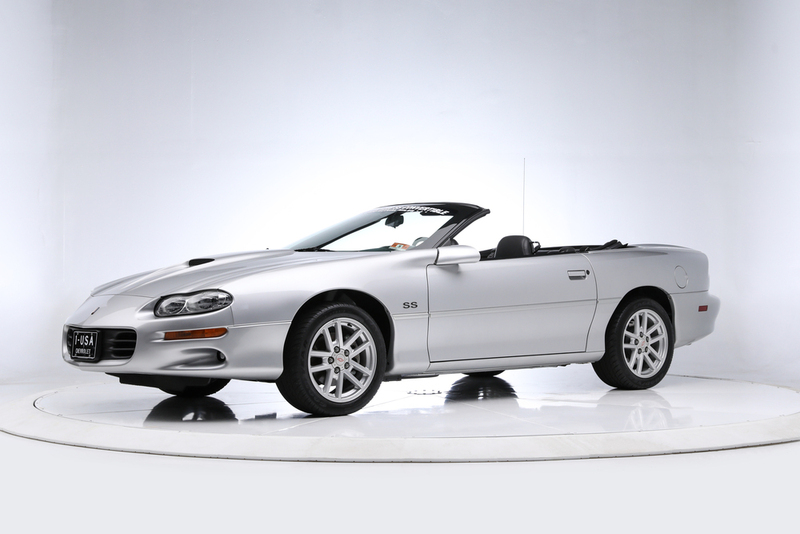 Having just over 9,000 actual miles from new, this SS convertible came from the factory with a 4-speed automatic transmission, 4-wheel power disc brakes, power convertible top, power windows, power steering, air conditioning, remote keyless entry, dual power outside mirrors, AM/FM radio with CD changer and 16” aluminum wheels. Other features include remote keyless entry, a leather-wrapped steering wheel and stainless-steel exhaust. The CARFAX report shows a single owner in New Jersey owned the car through February 2019, when it then was transferred. The Sebring Silver Metallic with black interior color combination is virtually flawless. 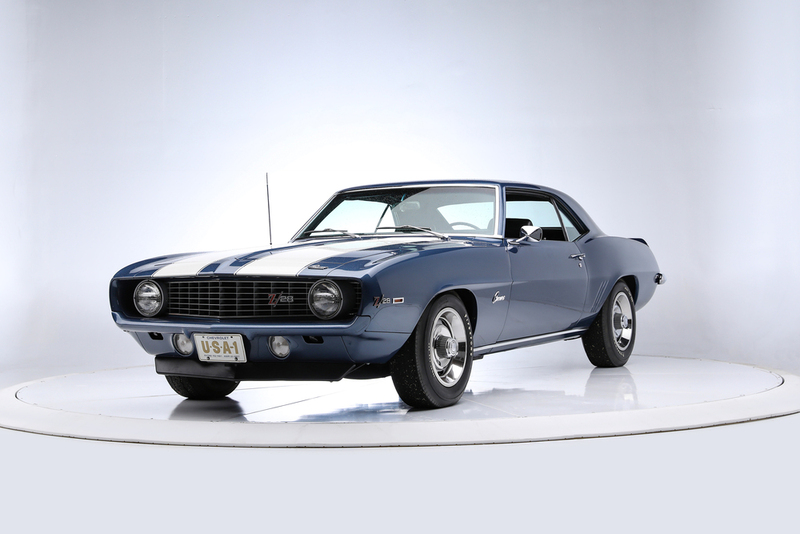 This highly collectible Camaro will undoubtedly give its new owner a “like-new” driving experience. The Shelby GT500 is distinguished from other Mustangs in the Ford lineup by a more aggressive exterior look with a signature coiled Cobra badge on the front grille and front fenders. It also separates itself with a unique aluminum power dome hood with functional heat extractors and unique Shelby front and rear fascias, rear diffuser, decklid spoiler, racing stripes and 19" painted forged-aluminum wheels rolling at the bottom. The black interior has leather sport bucket seats embellished with Cobra logos, features red racing stripes to complement those on the car’s exterior, and is equipped with the Electronics Package (a $2,340 option), including navigation and dual-zone climate control. Under the hood is an aluminum 5.4-liter supercharged V8 engine, derived from the powerplant inside the Ford GT supercar, which produces 550hp and 510 ft/lbs of torque; it’s mated to a 6-speed manual transmission. Showing only just over 26,000 miles on the odometer and a having a clean CARFAX report, it represents the perfect blend of drivability and collectability. 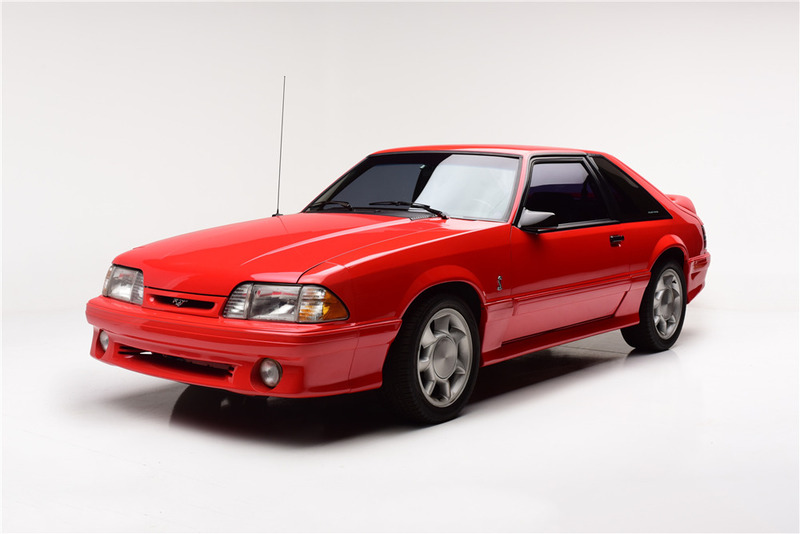 The top-of-the-line Mustang in 1994 was the Cobra, which featured more power, bigger tires, bigger brakes and a revised suspension that made it the ultimate factory Mustang. Powered by 5.0-liter V8, the Cobra was more powerful than the standard 5.0 and worked better at high RPM than the base engine, thanks to revised GT40 heads, a new intake manifold with revised runners, a different camshaft, roller rockers, a bigger throttle body, larger fuel injectors and revised engine calibration. And because of its near-revolutionary changes, the Cobra convertible was selected to pace the 1994 Indianapolis 500. Ford built 1,000 pace car replicas. By 1994, everyone knew Indy pace cars were pretty good places to park some money, and when it was a groundbreaking model like the new Mustang, many felt it was a good idea to pick one up as an investment. To find one used as a fair-weather toy and driven sparingly (just enough to keep it healthy) and not as a daily driver is rare indeed. All pace cars had deep-bucket tan leather seats with Indianapolis 500 logos embroidered into the seat backs as part of the pace car package, along with a 5-speed manual transmission. Number 781 of 1,000 built, this example is loaded with power windows, power locks, cruise control, air conditioning and a powerful stereo system. This car was kept in a heated and air-conditioned garage, and babied all its life. Seemingly one of the lowest-mileage original survivors available today, it comes fully documented with a clean CARFAX, extra keys (still in the wrapper), owner’s manual and only 11,064 miles on the odometer. Accompanying the sale is the boot for the convertible top, a bra for the front, a car cover, a poster and 1:25 scale model of the car, the original Window Sticker and a Certificate of Authenticity from SVT Special Events Team. In the glory days of Trans Am racing, great drivers like Sam Posey and Mark Donohue waged war on the racetracks of America in some of the best cars ever built. Ford’s Boss 302 and Chevrolet’s Camaro did regular battles that made for some of the sport’s greatest moments. Not to be left out was Plymouth, which not only fielded a great car in the form of the ’Cuda, but also won its fair share of races, too. 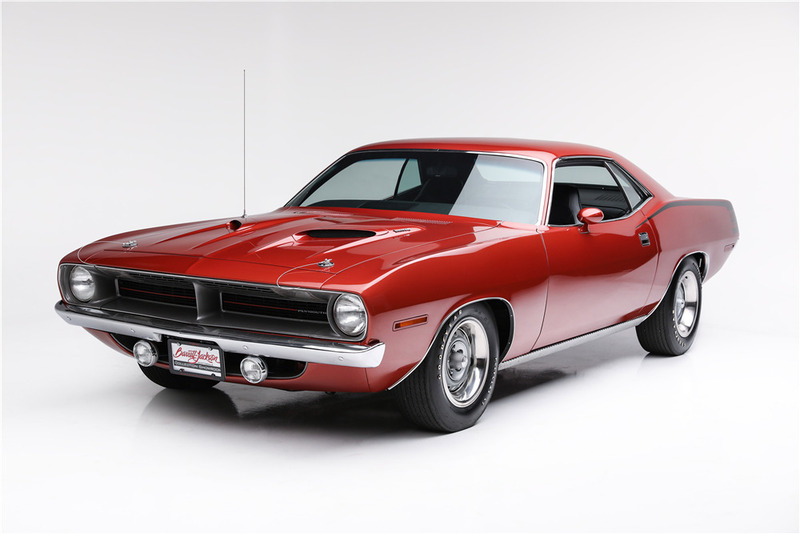 In 1970 Plymouth released an all-new ’Cuda. Abandoning its small-car roots, the new E-body platform unveiled a car as exciting as anything else on wheels. With the potent 440ci optional engine under the hood, it upped the ante to create what has arguably become one of the ultimate muscle cars. Timeless styling, powerful engine, limited numbers, racing pedigree and street credibility that lasts to this day (so much so that even many non-car people recognize the name) have all combined to make the ’Cuda a blue-chip investment. This example was originally built at the Los Angeles, CA, assembly plant and retains its matching-numbers 440ci, 375hp engine. Sporting its factory-optioned air conditioning with front heater, it was rotisserie-restored and finished in the original Dark Burnt Orange Metallic color. During restoration, an engine rebuild, automatic transmission removal, inspection and resealing was completed. All chassis items were removed for restoration, and the undercarriage was stripped and repainted. It has new fuel and brake lines, headliner, new body and glass rubber seals. The interior has the high-back seats, console and dash – all in pristine condition. Upgrades include power brakes and three-speed wiper system. A binder showing photos of the restoration is included with the sale. -- SALE PENDING -- In 1956, the 210 model series from Chevrolet sported a fair amount of chrome trim and deluxe interior appointments, making the vehicles attractive and comfortable. The rare 2-door wagon model combined sportiness with room for up to six passengers (when equipped with the front bench seat), with a large cargo area and a rear tailgate hinged to open from the back for easy access. Perfect for a picnic with the family, tailgating at a ball game or a road trip, the 210 wagon was the mid-50s version of a “sport utility vehicle.” Fast-forward 60 years. 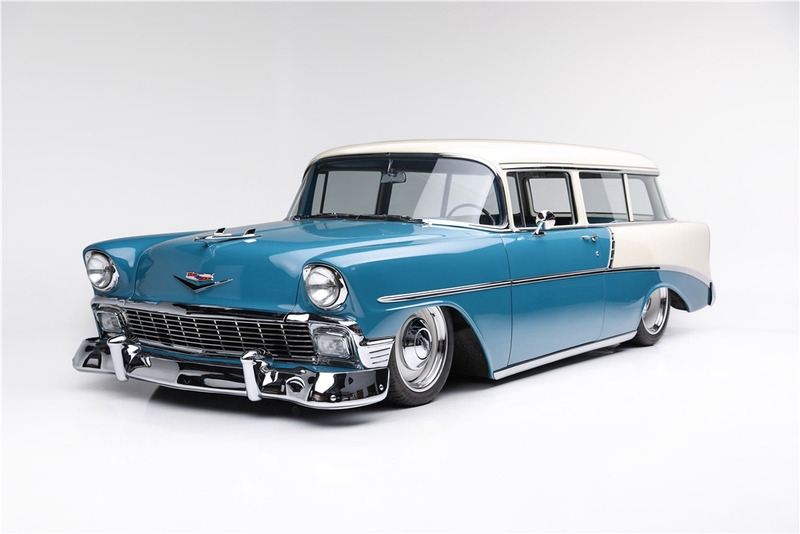 Now equipped with modern components and materials, this meticulously restored 1956 Chevrolet 210 Custom Wagon is just as stunning visually as it is to drive. Checking all the boxes and leaving nothing for the next owner to do, it is virtually spotless, mechanically sound and ready for enjoyment. Powered by a LS1 fuel-injected Chevrolet motor and backed by a 4L60E 4-speed automatic transmission, the car has upgraded air-ride CPP suspension hidden neatly below the cargo area. Power steering, 4-wheel power disc brakes with Wilwood Hydro-Boost, a Vintage Air heating and cooling system, and a fresh new interior provide all the comfort the driver and passengers could ask for. Custom wheels, new tires, updated gauges, tilt wheel, a JBL stereo and much more add to the ride. Documented with itemized receipts, a recent complete appraisal report and attention to detail at every corner – there is nothing left but to enjoy! Debuting at the 1962 New York auto show with a bare aluminum finish completed by hand with steel wool, the first Shelby Cobra captured the full attention of both the public and the motoring press. Terrorizing racetracks around the globe, the Cobra became one of the most iconic American muscle cars in history and was said to be a genuine assault weapon of handling and performance. Today, the Cobra is instantly recognizable, with original examples selling regularly in excess of one million dollars. Not to be confused with a replica or a kit car, this fully documented Shelby has a proper CSX number, a Manufacturers Statement of Origin and is signed by Carroll Shelby. 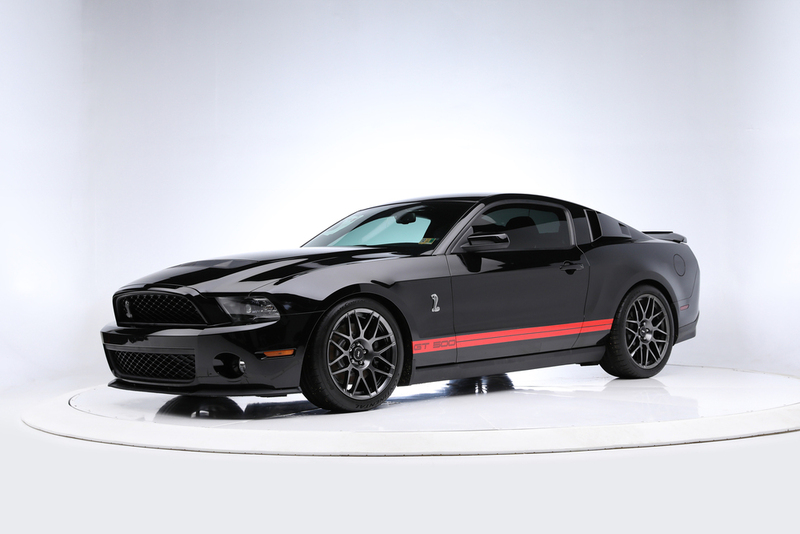 Only a small number were built each year, and each one is included in the official Shelby Registry. The “8000 Series” marks the continuation of where it all started. 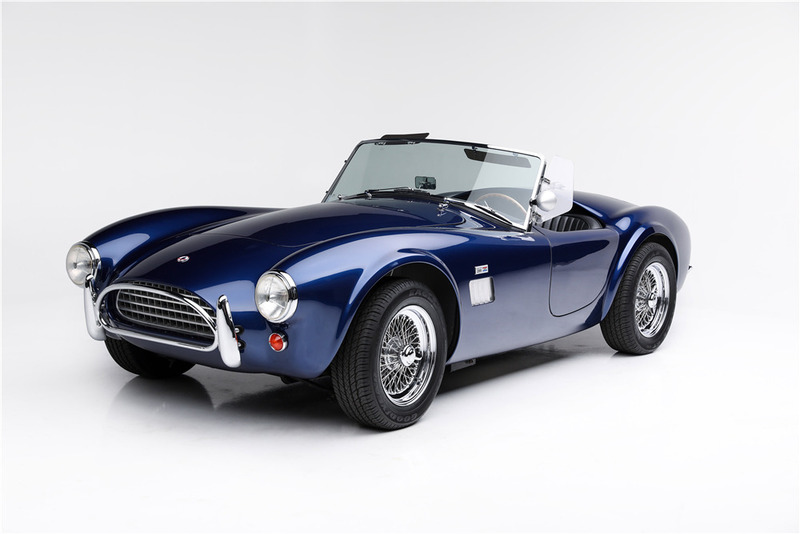 The 289 Street Roadster, or S/R, is a cleanly designed street car originally conceived by Carroll Shelby in 1962. These Cobras are supplied with under-car exhaust, wire wheels and all the street options of the day, including leaf spring suspension. There are improvements for safety and drivability, such as rack & pinion steering, superior brakes, improved cooling and a heavy-duty Tremec 5-speed transmission. With a Statement of Origin of May 25, 2005, the original owner purchased this Cobra through XK’s Limited in San Luis Obispo, who assembled it to his exacting specifications. Finished in LeMans Blue with black vinyl interior, today the odometer reads just 513 miles from new. Powered by an original 289ci Ford V8, upgraded with 351 heads ported with larger valves and more, the entire assembly was balanced and has a compression ratio of 9.6:1. Other standard equipment includes AutoMeter 289-type gauges, Baer racing brakes and 72-spoke wire wheels. A complete binder supporting the purchase, title, registration, build specifications, engine costs, and all receipts and communication from builder to the original owner are included. 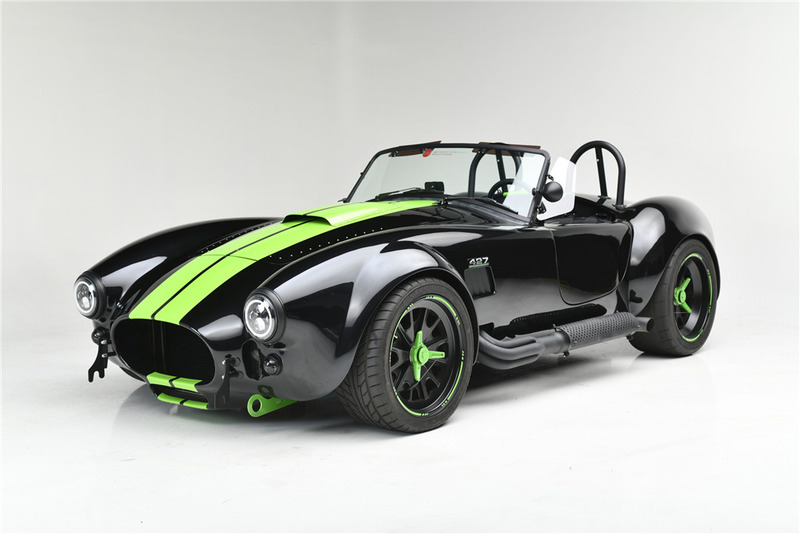 Titled as a 0000 Special Construction, this classic “slab-sided” 289 Shelby Cobra Street Roadster is now ‘turn-key ready’ for immediate delivery and enjoyment for the next owner.